Good morning and welcome to June! Can anyone else believe we’ve flown through 5 months of this year already? With this year careening ahead at lightening speed, I thought I would pause a moment and look back at one of my favorite consignment store finds EVER. It’s a huge crystal chandelier I scored from a consignment store! A few years ago while we were in North Carolina my husband and I were out shopping for a desk for his lake office. We didn’t want to spend a lot of money so we were looking at antique stores and consignment stores. While we were at a particular store in Denver, NC we found the perfect desk. But at the same time I spotted this beauty crumpled on the floor in a corner of the store. This is how it looked when I found it. I asked the store owner about the price and she said, $100. Are you kidding me??? This was one of those things that I knew I HAD to have. So, I asked her to hold it for me and I went back later and picked it up and lugged it back to Pennsylvania. All of the glass spires were surprisingly intact but most of the crystals were missing or broken. Based on the few remaining crystals, I ordered replacements in similar sizes to match, adding a few of my own. I cleaned the entire chandelier and carefully bent the leaves back into place. I hired an electrician to help me hang it. It’s funny, while I was holding it and he was connecting the wires, he asked me if it worked? Uh-oh. Actually I didn’t know until the moment he flipped the switch. Whew! It did work. Then I added the crystals. And here she is in all of her glory! 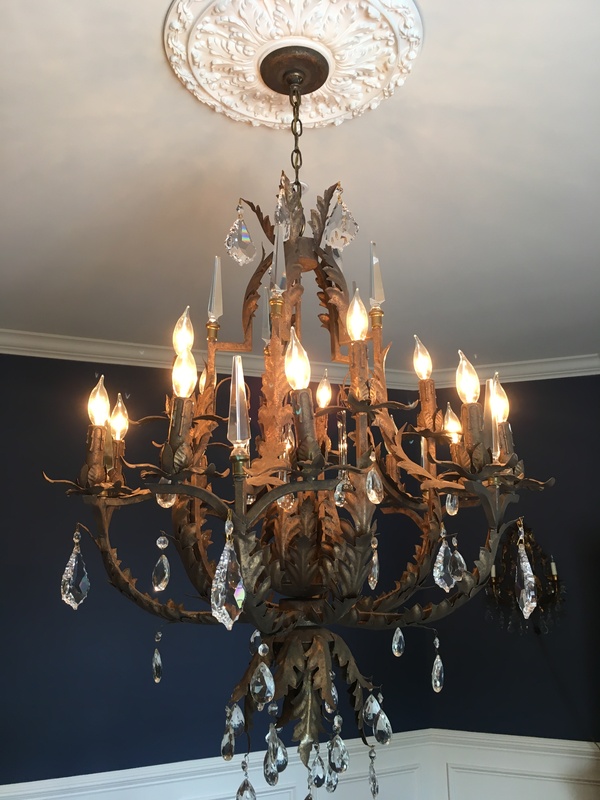 This heavy chandelier has 15 lights, 10 glass spires and about 50 various sized crystals. If you ask me? Perfection. I love it! And this was my attempt at rearranging furniture. (My Mother says I’m like a cat with her kittens. Always moving them around.) I tried these wing chairs in the dining room, but they are massive, so they didn’t last long. I ended up putting the leaf back in the table and returned the original arm chairs. It’s fun to try new things though. I really don’t want to leave this chandelier when we sell this house. However, knowing how little I paid for it might make it a little easier. Especially if the buyer falls in love with it, then I guess I’ll part with it. It could be a good bargaining chip. But, it may not be their cup of tea in which case, I’ll gladly haul it back to North Carolina! Christmas in the Butler’s Pantry! St. Nicholas in the kitchen!